The Oregon Petition, also known as The Global Warming Petition Project, is a petition of scientists to prevent the prevention of climate change. But are the rules for signing too strict? A Civil Engineer can sign because they are "trained primarily in the many engineering specialties required to maintain modern civilization and the prosperity required for all human actions, including environmental programs." A Doctor can sign because they are "scientists trained in the functional and environmental requirements of human beings on the Earth." A Web Designer can sign "Since the human-caused global warming hypothesis rests entirely upon mathematical computer projections and not upon experimental observations, these sciences [including computer science] are especially important in evaluating this hypothesis." Well to cut a long story short, I am not on the list. Perhaps because I didn't fill out the part that says 'My acedemic degree is'. In fact you'll notice I crossed it out because "acedemic" degrees are essentially just enforcement of Team Science. By doing so it sets the bar too high. Am I any less qualified on climate than a vetinary surgeon? What does a doctor know about ice caps? Water freezing and ice melting is at least something I am somewhat familiar with in pipe systems. While distributing Petition forms to friends and neighbours I discovered that my next door neighbour, who is a web designer, has a BSc in Computer Science and so is eligable to sign it. Bet you wondered why I singled out web designers earlier, now you know. But my neighbour knows nothing about climate (he drives a Prius...) and as a result he won't sign anyway. 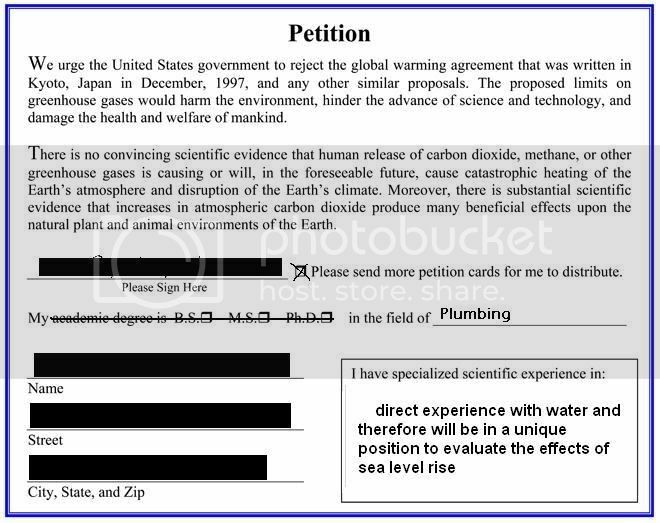 So in this situation all the Petition Project rules have accomplished is warmists don't sign and skeptics can't sign. Is that the intended consequence? Is the Petition Project deliberately filtering out skeptics like me from being able to sign it? Could perhaps the Oregon Petition be a plot by warmists to make it look like there are far less skeptical scientists than there actually are? I am simply asking questions. Perhaps you'll have more success than me at signing. But it appears you will need at least a BSc or equivalent qualification. Don't worry if you haven't studied climate or haven't published anything to so-called "journals", thankfully at least that is not a requirement. 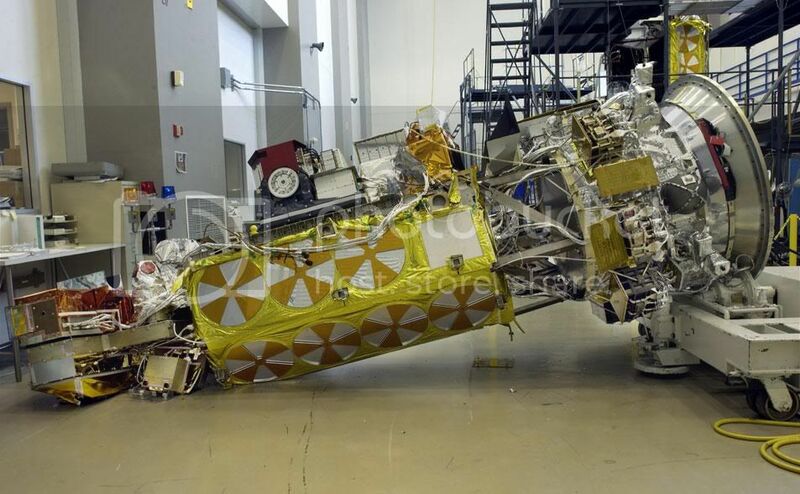 Company (LMSSC) Sunnyvale that required repositioning the Television Infrared Observational Satellites (TIROS) National Oceanic and Atmospheric Administration (NOAA) N-Prime satellite from a vertical to a horizontal position, the satellite slipped from the Turn-Over Cart (TOC) and fell to the floor (see Figure 3-1). 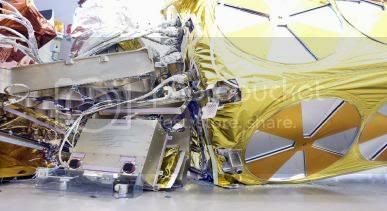 The satellite sustained heavy damage (see Figure 3-2), although no injuries to personnel occurred. The exact extent of the hardware damage is still being assessed." 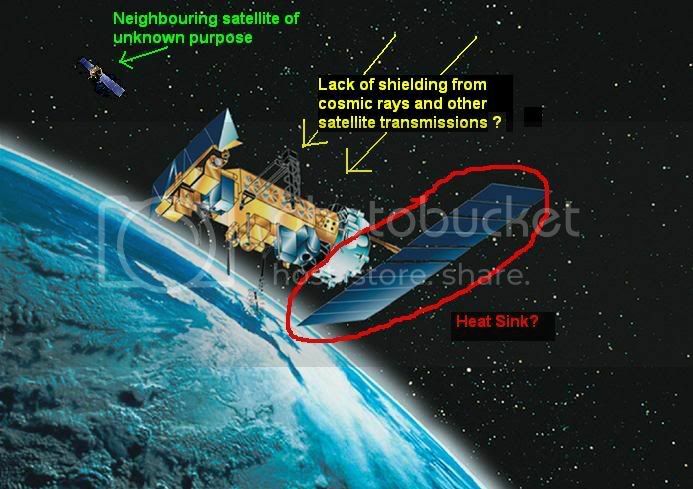 Are the self-proclaimed IPCC aware that such a sensitive instrument suffered heavy hardware damage prior to launch? How does this affect said instrument's ability to measure temperature to tenths of a degree accuracy? Could this hardware damage in fact be causing a false warming trend? How is Al Gore related to all of this? So many unanswered questions tell us that there is plenty of doubt and unsettled science here, which is what we seek as blog scientists. Some people may be disapointed that I didn't end the post with a strong conclusion, but never fear. In blog science the conclusion or 'take home message' is usually found in the comment section left by readers who were able to read between the lines and spell out the conclusion I was leading to but didn't want to directly state. To be more specific, I cannot always state the conclusion directly because to reach and convince a wider audience I must maintain a high sembalance of professionalism. I must refrain from making specific claims which could be held against me if found in error. If a blog scientist is to convince journalists to spread their message they must avoid making easily identifiable errors or be seen to be 'name calling'. This is why in the above post I have simply posted a fact from the news followed by a series of open, but I hope, very leading questions. Feel free to draw my conclusions for me, that is what the comment section is primarily for after all. Note: I had to permanently delete some comments from the last article because certain commenters were using the word 'conspiracy' directly. One poster (who will go unnamed, but who was perhaps a warmist troll) simply posted 'Its all a big conspiracy!" 30 times. A fair warning: Anyone who uses the word 'conspiracy' directly will have their post removed. That sort of language is not compatible with the reputation of this Blog. Lets be more grown up and subtle please. The phrase 'team science' is an acceptable alternative. Another inconvenient truth for warmists. New research suggests that the co2 level of the atmosphere was a lot higher during the Medieval Warm Period than today. First lets look at a paper that shaped the modern view of past co2 levels. 180 Years of atmospheric CO2 Gas Analysis by Chemical Methods, published in the prestigous Journal "Energy and Environment" by Dr Ernst-Georg Beck. There is no question over the accuracy of the earlier measurements. The drop in co2 in the early 19th century to the start of the 20th century was most likely caused by cooling from the little ice age. While the earlier measurements are beyond questioning, the measurements since 1960 are deeply uncertain. This modern measurement period began warmists started measuring co2 at Mauna Loa in Hawaii. This Mauna Loa sensor reports the gradual co2 rise you see in the graph. Mauna Loa is on a Volcano! That's right, they could have picked anywhere in the world but warmists chose to put the co2 sensor on top of one of the biggest volcanoes in the world! No wonder it shows a rise in co2! 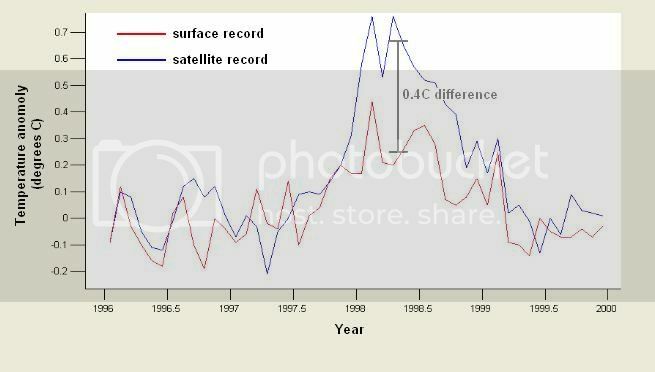 Now lets look at a period not covered by the graph, but a period we know was a lot warmer than today. 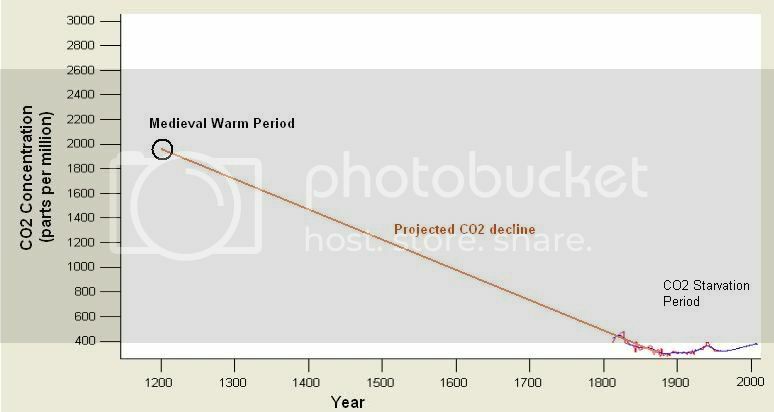 The medieval warm period occured some time in the past around medieval times. Ie 1200AD. Didn't last though. Eventually the climate shifted back again and the Vikings were wiped out by ice. The answer is that based on the best science available, co2 levels may have been over 2000ppm in 1200AD! Is it coincidence that 1200AD was 800 years ago? Recall the fact mentioned earlier: "ice core measurements show that co2 levels rise happens 800 years after temperature levels rise". Everything is fitting into place and this last piece seems to complete the puzzle. It has been shown that co2 levels could have been over 5 times higher just 800 years ago. If this is the case a doubling of co2 is proven to not cause any significant warming and any ideas for more taxes should be immediately abandoned. Times more massive than a co2 atom. The Sun is over 100000000000000000000000000000000000000000000000000000000! 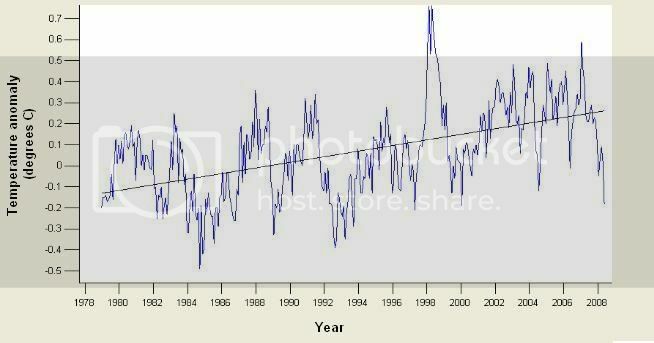 Now you see how ridiculous the claims of warmists are. 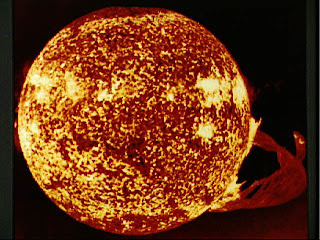 They tell us co2 will kill us all by heating us when it is so insignificant compared with the sun. *Note the figures were given to me in kilograms. A kilogram is 2.2 pounds. The side bar is a feature I will use regularly to teach my readers "dos" and "donts" of science that I have picked up over the years. Today I will talk about a relevant "don't" that is potentially muddying the mind of the warmists. The 30 following the 10 is called the exponential. It indicates how many zeros follow the number. In this case it says there should be 30 zeros after 20 (2 x 10). Exponentials are often used as shorthand by people who don't want to bother writing all the zeros out. That's fine if you are just keeping score in a very long game of football! But if you are an engineer designing a saftey system, or a scientist conducting an experiment, you should really take the care to accurately write out whole numbers. Writing out the zeros gives you a better appreciation of the size of numbers and you might spot potential errors. Perhaps an overuse of exponentials is why a minority of climate "scientists" don't comprehend how ludicrious co2 warming really is. If they just compare 5 digits with 5 digits for Sun vs CO2 they might not contemplate how massive the sun is compared to an atom of co2. If Global Warming is true, why are there still snowstorms? Well not to us seasoned Skeptics. If Blog Science teaches you one thing (which you won't find in any "course" or "textbook" by the way) it's to use your common sense above everything else. In science quite often you can guess the answer to most of questions just by applying common sense based on real world knowledge. Lets try it now. 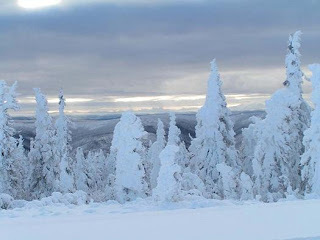 Why are the so-called experts silent about all the snow that is everywhere? And wait for the crickets. Perhaps show them some photos of snow too to put the point home.